When entering a JPG digital image for a club competition, it must be resized to a maximum of 1600 x 1200 pixels for a landscape image , or 1200 x 1600 for a portrait image. It can be smaller if you want, but no bigger. All photo editing software can resize files. Easiest way to resize jpeg images in Windows? 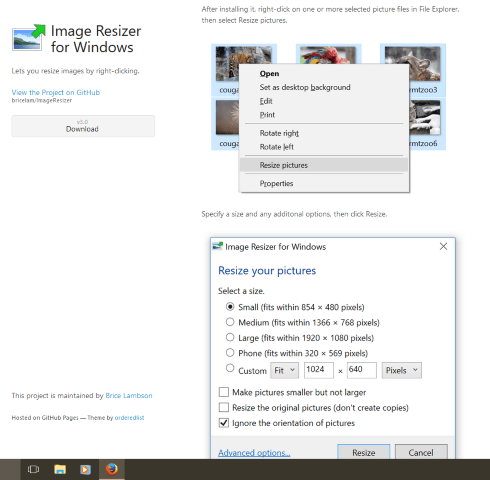 Download the “ImageResizerSetup.exe” file , click on it and simply follow the install procedure. Once it is installed , open windows file explorer (not a graphic program) and RIGHT CLICK on any JPEG file on your computer. In the menu which opens, you should find a “Resize pictures” entry. Click on that and a small window will open, giving several options. Select the “Custom” button. “Scale to” then enter the sizes in pixels. For club competitions, these will be 1600×1200 for landscape and 1200×1600 for portrait format. Don’t select “Replace originals”. The resized copy will be saved to the same folder as the original with a name like ABC(Custom).jpg. That really is the easiest way to resize images I know . Almost any photo-manipulation program will do the same, but having the permanent right click option avoids the need for them. If you prefer to use other programs, here are a few. In Faststone Image Viewer http://www.faststone.org/download.htm , in browser mode, select the file, then click “Edit Resize/Resample” and select sizes as before. Look for the “Preserve aspect ratio” box, bottom left. If you want to keep the same proportions, click that and just put in the first size. The program will automatically fix the second size. You then need to go to “File. Save as” and give it a new name, OR IT WILL OVERWRITE THE ORIGINAL. Faststone also make a dedicated Image Resizer program, but I find it more complicated than it’s worth. In Irfanview, the procedure is very similar. Just start by opening the file with Irfanview, then click “Image, Resize/Resample” and follow the same procedure as above. It will seem that absolutely nothing has happened, but the image has been resized. You just have to save it with a new name. In Photoshop to save a JPG, use the “File/ Export as” command. In the export window, just enter the size you want in the “Image Size” space. The canvas size defaults to the same size. If you want a border frame, set the canvas dimensions 20 or so pixels larger. Make sure the background colour is white, or whichever colour you want. In GIMP, use “Image , Scale” “Scale” and “Resize” seem to be used as synonyms for most purposes by different software. The question of “DPI” (meaning “Dots per inch”, not “Digital Projected Image”), often arises when resizing. Ignore it. Unless you are resizing to print at a specific resolution, DPI is irrelevant. A Digital projected image with a DPI of 1 and one with DPI set to 300 will be identical. Keep in mind that resizing really only works well downwards:- It’s possible to make a small image larger, but it will involve loss of quality as pixels will be interpolated. It’s like blowing up a balloon- the writing on the side gets bigger, but looks rougher. Making images smaller (unless you go too far) involves less loss of quality. Cropping an image also makes it smaller and it makes sense to crop first then resize if necessary. Whenever you resize an original image, whatever method or program you use, make sure you save it with a different name, so you don’t overwrite your original image. Nb- HCC’s projector has a maximum resolution of 1400 x 1050 pixels, so an image of 1600 x 1200 pixels will still be displayed at 1400 x 1050 resolution. So if your image is 1400 x 1050, it’s OK for HCC internal competitions, but if saving as a JPG, you may as well size it to 1200×1600 or 1600×1200, because… The PAGB has now approved 1600×1200 as a standard, (from January 2017) so for external competitions, we will use that – BUT! Don’t resize upwards. If your image is smaller than 1600 x 1200 to start with, LEAVE IT ALONE! “Upsizing” can degrade image quality badly.